Valiant Grape Jelly for sale. Buy online at Zingerman's Mail Order. Gourmet Gifts. Food Gifts. 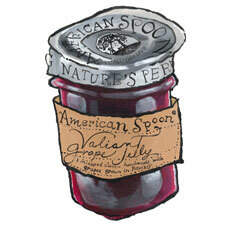 For many, grape jelly is the sweet smear of youth, coupled with its soulmate: peanut butter. As an adult, I still love peanut butter (especially Koeze’s) and there are dozens of artisan jams and jellies I covet, but none of them are grape. Luckily our friends at American Spoon turned their attentions toward the Valiant grape, a hearty variety that grows well where it’s cold (like northern Michigan, where American Spoon makes all their preserves) and is known for its super sweet, rich, jammy flavors. The kid inside you will remember the sweet taste, the adult you’ve become will appreciate its depth and complexity. Pair it with your favorite peanut butter, sure, but then try it out everywhere: on pancakes and waffles, smeared into scones, or over rich, nutty gelato for a grown-up take on the childhood favorite.